I have had a lovely surprise this morning. I can tell you there were quite a few squeals of excitement when the postman arrived. 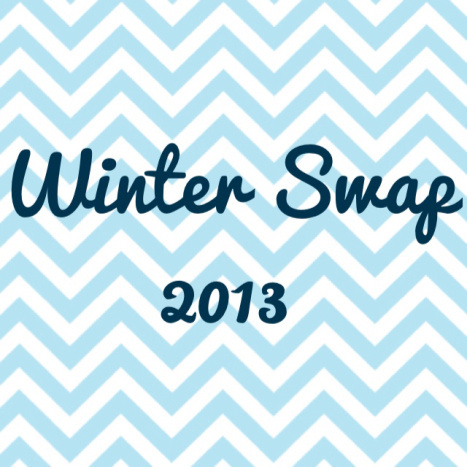 It all started about the month ago when Penny from Dresses and Me announced her Winter Swap 2013 (she’s over in Auckland). 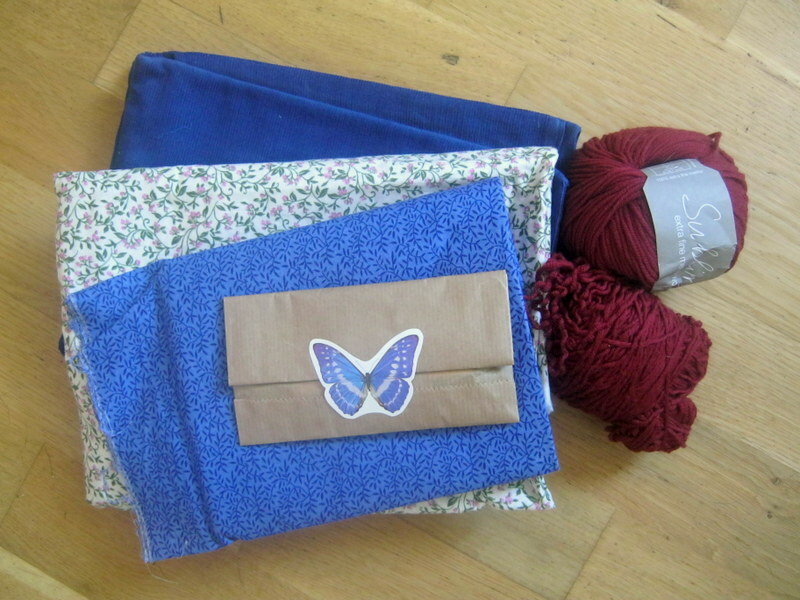 The idea is to be matched up with a fellow blogger and sewing enthusiast, have a look through your stash and put a package together to send some things that you love; bought but have never used; patterns you aren’t sure if you will ever use but bought because it was ‘just too cute’ etc. It’s my first swap so I was a bit nervous (not really sure why). I was paired with the lovely Rosemary from Thimbles & Threads (do pop over and have a look at her blog, she has just finished making the most beautiful wedding dress for someone). I think my favourite thing about the swap is meeting new people and her blog has become a firm favourite! Anyway, back to my very exciting surprise. 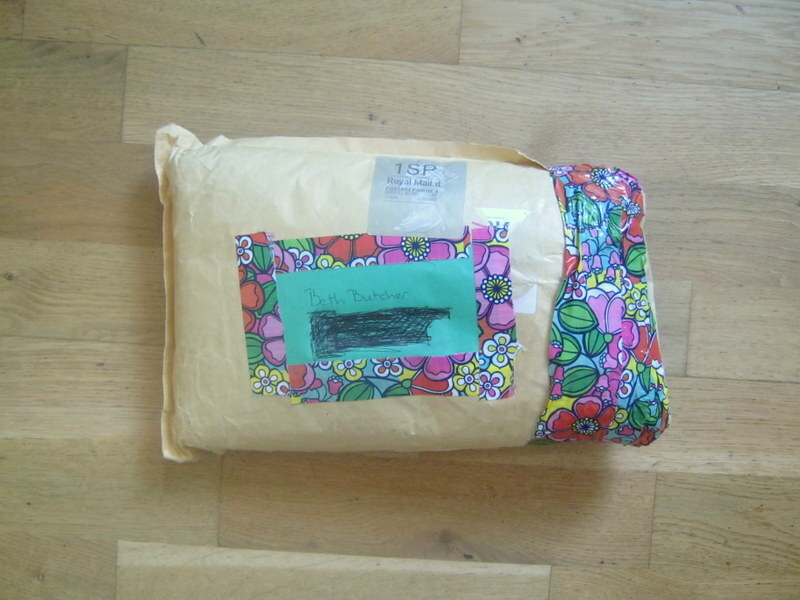 This arrived (look at the brightly coloured tape on the outside, isn’t it wonderful?). This is what I found when I very carefully unwrapped it (I did not in anyway tear it open in excitement!). *squeal* some beautiful Sublime wool (brain is now working over time as I decide what that will become)! *squeal* floral fabric (I love flowers as anyone who knows me will tell you). *squeal* (I told you there were a lot of squeals didn’t I?) Blue corduroy. Now I was thinking just the other day that I needed to get some corduroy. I’m going to take the plunge and take a dressmaking class where we learn the basics and come out the end with a skirt. I want to make a corduroy skirt (possibly 2 tone, I haven’t finished the design in my head yet). I think this will be perfect! I won’t use it in the class because we need a medium weight cotton but I’m hoping that I will learn enough (or rather get enough confidence) to start making my own things. Anyway back to the package. You might have noticed a little brown paper bag with a butterfly on it? 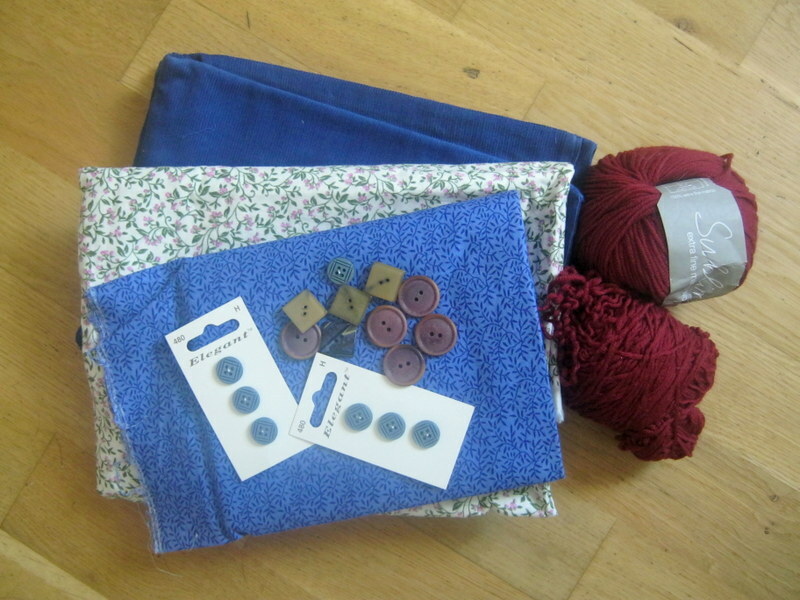 Well imagine my delight when I opened it to discover some pretty buttons (I am a magpie when it comes to buttons). I think my favourite ones are the square ones, my brain is already swimming with ideas of what to use them in. I hope you are all having a great weekend too. Yay! I’m so glad your parcel arrived and that you’re thrilled with it! I am so glad you liked it! Good luck with the skirt making class!